A couple of days ago it was snowing here in Scotland, and today its been piddling down with rain. 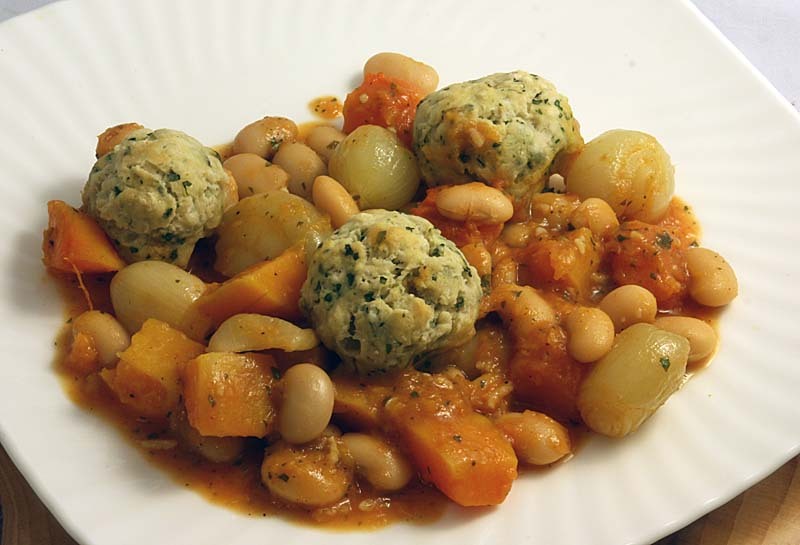 So lets tuck into this warm, orange tinged plate of food made up of Butternut squash, butter beans and baby onions. D enjoyed the dish, but said he found the coriander dumplings a little dry. I told him these dumplings were meant to be crispy on the outside and fluffy on the inside. The butter beans provided perfect contrast as they melted in your mouth and the gravy was unctuous and flavourful. For the casserolePreheat oven to gas mark 7. 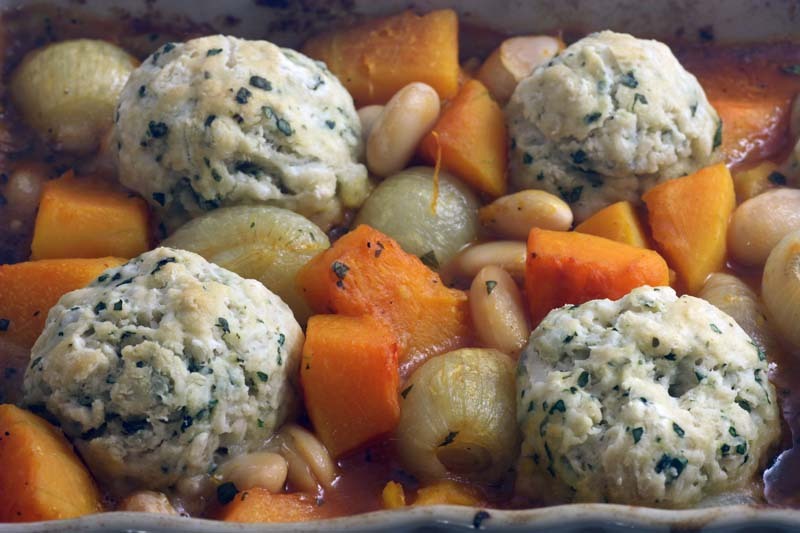 Place the butternut squash and onions or shallot on a large baking tray. Add the oil and coat the vegetables. Season with salt and pepper and roast for 20 – 30 minutes until the vegetables are tender. When the veg is cooked, remove from the oven and turn the temperature down to Gas mark 4. Add a tablespoon of flour to the roasting tin, stirring to coat the vegetables to soak up the juices. Add the garlic and a little vegetable stock , making sure you scrape the bottom to release all the sticky caramelized bits. Transfer to an ovenproof casserole and add the tomato paste, coriander, butter beans or chickpeas and remaining stock. Give it all a good stir, bring to the boil and cover. Cook in the oven for 30 minutes. While this is cooking, make the dumplings. Combine all the dry ingredient in a large bowl. Add minced coriander and enough cold water to bring them together into a soft dough. Shape the dough into 8 small balls and set aside. Remove the casserole from the oven and carefully add the dumplings, so they float on the surface. Return to the oven for a further 20 minute. Adapted from UK Shallots. I'm allergic to Coriander so this one would be no good for me, but if you used parsley instead I would love this dish. Lovely comfort food, sounds like you need it up there. We have actually had a reasonable springlike day here today and the blackbirds were really serenading it, it was wonderful. I hope it happens up there soon. How can you like cardamon and not coriander? But its a fair point, a couple of my other readers have a strong aversion to coriander too. I love it, anyway, You can sub the coriander with parsley, even sage. I only used it as that is what I had at hand. Lucky you for having springlike weather, I haven't stepped out in my garden for a while - oh I fib, I did to take the compost out. Wow that is a wonderful dish - I am bookmarking this one - Thanks for this lovely post! I love a good casserole in winter! Haven't had butterbeans in a long time. Sounds like a very comforting combination here - and healthy too! WOW this is such a comforting dish.. thanks for visiting my blog..your pictures and presentation are very nice..lovely blog...happy to have dropped here. Ooo that looks so yummy...especially the dumplings! It was a very comforting combination and healthy too! You have a sweet day too. oh, love the look of the dumplings. I really must try some dumplings. They make a nice change now and again. 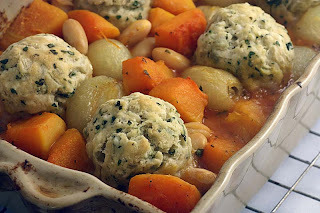 The dumplings and the casserole looks very inviting, so yummy. Thank you so much for your comment Umm Mymoonah. We don't really get any coriander in this part of the world, but lots of cilantro, do you think that will work? And baby onions? Be still my heart. and baby onions - can easily be replaced with shallots. Funny! I was trying to tell my husband that, and he being the Scotsman that he is was telling me I was wrong. Thumbs up to you my friend. I'm So glad you were right! I just made this (without the dumplings) it was delicious! Thanks for all the great recipes you share, you really got me out of a rut.My diet is so much more interesting and tasty now. Thank you Charley for such a lovely comment/compliemnt. My fiance hates coriander, so I substituted it for parsley and a little sprinkle of tarragon, which works extremely well with the sweetness of the butternut squash!